open the Innovation Hub on Wheels. Schneider Electric, a leader in digital transformation of energy management and automation, in partnership with Knowledge Oasis Muscat and the French Embassy in Oman, has launched a showcase of Smart City innovations that could enable residents and businesses to save time and money on their utilities. In support of the Oman Vision 2020 nationwide transformation agenda, Oman’s utilities providers are heavily investing in Internet of Things innovations that can enable smart utilities. A report by TechSci Research is predicting that the GCC’s smart grids market will triple to $1.7 billion by 2026. Many of Oman’s innovators participated at the event held at the Knowledge Oasis Muscat. 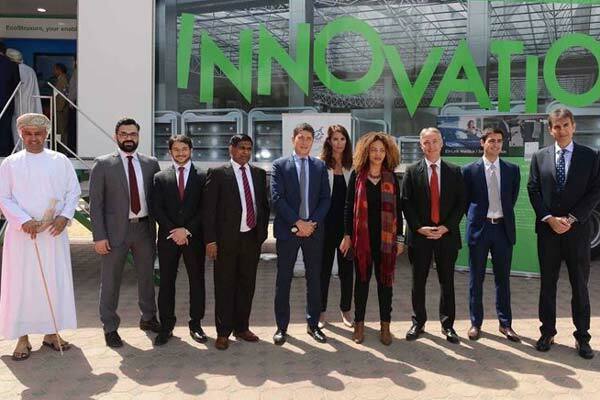 As part of the event, the Embassy of France in Oman and Schneider Electric launched the Innovation Hub on Wheels. The Innovation Hub on Wheels showcases 17 Internet of Things use cases for Schneider Electric’s EcoStruxure architecture and platform, covering the segments of building, transportation, water and waste water, oil and gas, utilities, and data centre. Smart meters, remote terminal units, and advanced distribution management systems can be combined to provide flexible and scalable platforms for smart utilities.